Taking The Soul For A Walk. 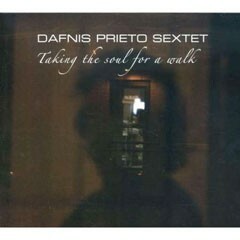 Dafnis Prieto Sextet (Dafnison Music). Prieto's October RJA appearance was like Miguel Zenón's in April: a brilliant showcase of the fresh jazz springing from Afro-Latin and Caribbean roots. The album sparkles even more with the addition of Yosvany Terry's sax and Avishai Cohen's trumpet. Awake. Miguel Zenón (Marsalis Music). One listen will tell you why Zenón recently received a MacArthur "genius" grant. His music displays a level of rhythmic thinking that leaves mere mortals slackjawed, but never at the expense of a soulful melodicism that even Steven Colbert could not deny. Appearing Nightly. Carla Bley and Her Remarkable Big Band (Watt/ECM). Her gift for surprise no longer surprises us. Her feel for the outrageous no longer shocks us. Her consistent sense of grace in the heart of the most surprising and outrageous passages? That always knocks us out. Pass It On. Dave Holland Sextet (Dare2/EmArcy). Holland's newest group has the virtuosity, sterling interplay and rhythmic virtuosity of his great Quintet. This is the first time he's used piano, and newcomer Mulgrew Miller's playing enriches the group's sound without costing it any of Holland's trademark contrapuntal clarity and freedom over a groove. The compositional style is dynamic but restrained, and Holland's experience with his big bands is evident in horn arrangements that suggest a much larger ensemble, and swing hard -- but not loudly. Little Things Run the World. Ben Allison (Palmetto). On first listen, some tunes strike you as deceptively slight: Bacharach for post-rock jazzers. (Not that that's a bad thing.) But Allison's composing is simultaneously folksy and urbane, artless and subtle -- program music for everyday life in the year 2008. Roll Credits. Notes From the Village. Anat Cohen (Anzic). From the propulsive polyrhythms of the album's opener -- surveying the world's music through the prism of Greenwich Village's Washington Square Park -- to the off-meter, up-tempo playfulness of the closer (a swinging cover of Fats Waller's "Jitterbug Waltz"), this album cooks. Cohen is a crowd-pleaser, but she is also (as Nate Chinen put it in the Times) "the real deal." Like her pianist and longtime collaborator Jason Lindner, Cohen treats jazz as innately cosmopolitan. That's jazz's history -- but in Cohen, it's also jazz's future. Early Reflections. Bennie Maupin (Cryptogramophone). The one-time collaborator of Miles Davis and Herbie Hancock works this time with a group of Polish musicians steeped in the sounds and soul of the Old World. The result is a journey at once idyllic and adventurous, making the old new and burnishing today with the flavors of days gone by. Sheer, unadulterated, pure scary beauty. Crossing The Field. Jenny Scheinman (Koch Jazz). Present Tense. James Carter (EmArcy). Tie: Force of Four, Joe Locke (Origin) and Cirio, Francisco Mela (Half Note).